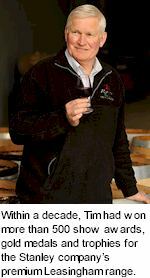 Tim commenced winemaking in Clare, South Australia, with the renowned Knappstein family owned Stanley Wine Company. Within a decade, Tim had won more than 500 show awards, gold medals and trophies for the company’s premium Leasingham range, though his unrequited passion for cool climate wines led Tim to the Adelaide Hills in 1981, where he planted the first vineyard in the Lenswood district. Respected as one of Australia’s most informed and experienced cool climate vignerons, Tim has judged at regional, state, national and international wine shows since 1975, and is currently chairman of judges at the Cowra Wine Show and National Cool Climate Wine Show in Bathurst, New South Wales. 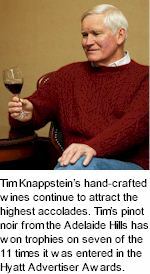 Tim Knappstein’s hand-crafted wines continue to attract the highest accolades. Verifying his expertise as a cool climate wine craftsman, Tim’s pinot noir from the Adelaide Hills has won trophies on seven of the 11 times it has been entered in the Adelaide Hyatt Advertiser Wine Awards. Working closely with selected growers to obtain the highest quality fruit, Tim’s vast knowledge and expert skills enable him to produce highly individual cool climate wines of undisputed premium quality – evident throughout the impressive Riposte portfolio of wines. Tim makes much of his Pinot Noir in the lighter French styles of the suppler Burgundies or crisp Beaujolais. The Dagger is a rich fresh earlier drinking wine with all the trademark Pinot aromas and flavours. Drink when young while the edge is keen. Currently being served by Qantas in Business Class. The fruit for Cutlass Shiraz is selected from a vineyard at Woodside in the Adelaide Hills. Small batches of grapes are crushed, fermented and pressed separately then aged in French oak. The best barrels are then selected and blended before bottling. The Stiletto Pinot Gris glides seductively across the palate from initial lifted nashi pear and tropical characters to a final stab of spice. Supple rich, mouth filling fruit leads to a finely honed finish of crisp acidity. The Foil Sauvignon reflects the region’s reputation for excellent and memorable Sauvignon Blanc. The Rapier Traminer is crushed and immediately pressed, separated and fermented in French Oak to provide extra texture and complexity with the juice settled to moderate clarity. Tim also consults to a small selection of wineries. When Tim is not making wine much of his time is spent with his Datsun 240Z race car. Tim is an ex Australian champion glider pilot and power pilot but then swapped his love for speed in the air to motor sport. He competed in the Classic Adelaide 5 times in his Mini Cooper S. Tim enjoys Tarmac Rallying and has entered the Datsun in the Classic Adelaide, Mt Buller and Adelaide Hills Tarmac Rally, as well as racing the car at Mallala and Phillip Island.